Following 14 sell-out tours, the king of improvisional comedy is back, with latest tour Tangleman making its way to Cork on the 7th of December. Noble started out doing comedy at 15 and by now, at 37, should be well versed in the art. He explains, “I suppose I’m a bit like Bob Dylan, I’m just on one never-ending tour.” Tangleman, presumably named after the comedian’s signature frizzy locks, will be more of what we all know him best for; winging it – and working it. According to the tour’s official press release “he has no more of an idea what he’s going to say than the bloke in row Q” and unlike many stagnant, obviously rehearsed popular comedy shows that claim the same, in Noble’s case it is actually believable and successfully ensures his shows stay fresh. With this attitude, Noble finds himself touring a show that is, more or less, different every single night. Noble explains that this sometimes results in people attending his shows more than one night in a row. It’s also more than clear that he gets as much as he gives from audiences, sourcing much of his material right there and then in the moment, from speaking to audience members while on stage. Though Noble seems to express a preference to live shows, rather than appearing on screens, one of his greatest success to date has been the first series of Freewheeling, a TV show which took him all over the country on his motorbike this year, following suggestions made from the public on Twitter. Among the many odd and spontaneous situations Noble found himself in, over the course of the season, a personal highlight of the show for him was when he went “to investigate whether Lesley Joseph had been rude to a guy in a café in York.” The situation occurred when Noble asked Twitter “What celebrities have you seen, and where have you seen them?” and somebody tweeted and said Lesley Joseph had been in a café opposite where she worked and had been rude to someone in there. And so, Noble “turned up there and heard the story. And obviously, legally, you have to be balanced, so I was sat there wearing the face of Lesley Joseph. That sounds massively sinister. I wasn’t wearing it in a Silence of the Lambs way. I got a tattoo artist to do a pencil drawing of Lesley Joseph’s face, and I was wearing it on my face… Then she walked past the café, so I chased her down the street! That was just amazing.” Freewheeling certainly is popcorn-worthy watching, with a good bit more audience interaction than is usually possible with television shows. It’s set to be confirmed, but is likely season two will return next year. A big fan of his motorbike, as evident in Freewheeling, Noble often takes his bike on tour – including clocking up 26,000 kilometres when touring around Australia. “The travelling is the most boring bit of touring,” admits Noble, so be sure to keep an eye out for a curly haired comedian on a motorbike in Cork this December. 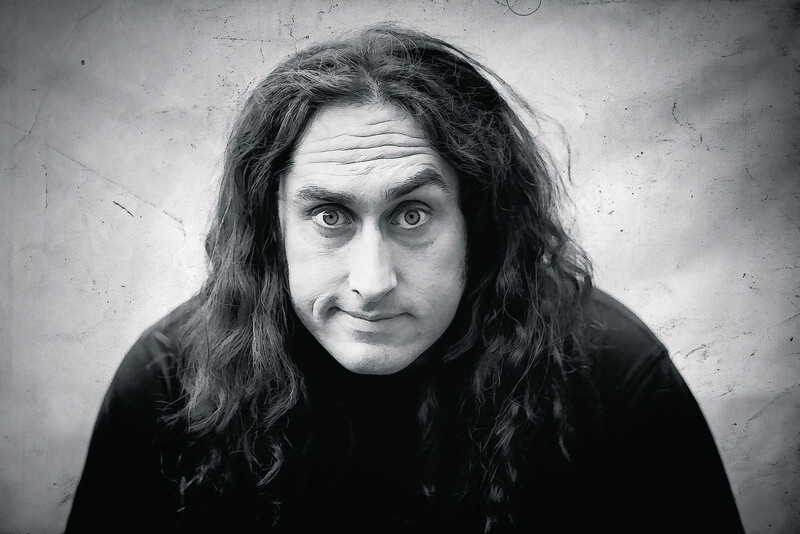 Ross Noble will perform in the Cork Opera House on Sunday the 7th of December. Tickets are €25 and available at www.rossnoble.co.uk. Printed with permission from KPPR TV.